This leaf-shaped, wooden dance shield is known as ndome and is used in boys’ coming-of-age ceremonies among the Kikuyu people of central Kenya. 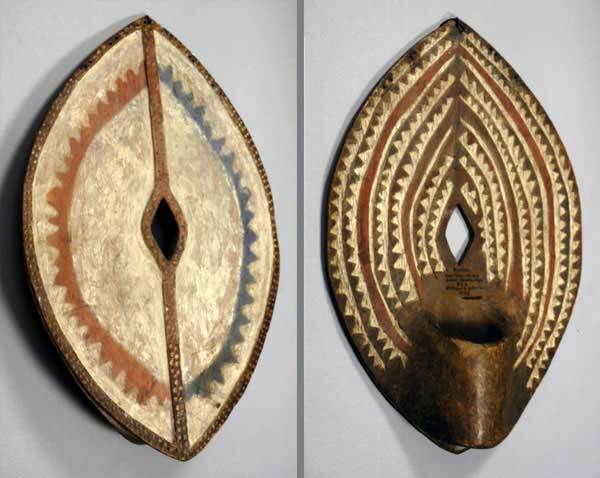 On the reverse (shown here on the right) it has an arm grip carved from the solid and is decorated with carved zigzag designs painted in red, black and white. The rite of passage into adulthood for both boys and girls is important to Kikuyu culture. The initiations of both sexes are separate affairs but both involve circumcision and the use of shields. For boys, the ceremony is called Irua and takes place between the ages of fifteen and eighteen. First, there are a number of dances. The boys wear the ndome shields during these dances to symbolise the adult warrior status they are about to acquire. The ring on the back of the shield is worn under the left armpit, so the shield itself stands high above the head of the dancer. After the dancing comes the surgical operation itself, performed at a special ritual location known as theIteri. To preserve their family honour, the boys are expected to undergo the operation in silence, without flinching. Several boys are circumcised at once and each new set of initiates (mwanake) is considered to be a distinct age set (rika). Each rika is given a group name and its members treat each other as brothers for life, and fight together in battle. Undergoing Irua is attractive to Kikuyu boys for a number of reasons: An uncircumcised male (no matter how old) is prevented from owning possessions, socialising with adults, fighting as a warrior for the clan, marrying, or sleeping in the Thingira - a communal house for initiated young men where initiated young women are permitted to visit.